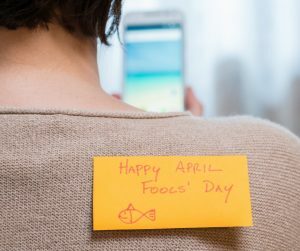 Today is April Fools’ day, an annual celebration that is filled with fun and excitement. A day for pranksters to go wild. Around this time of the year, pranksters begin planning with time and energy how to catch their victim off guard and caught in the prank. While the majority of April Fools’ pranks are all in good fun, some do go awry. Using common sense can help avoid accidents and injuries. Remember, if there is any possibility that a prank or stunt may harm a person, it should be avoided. Playing pranks on a driver or his vehicle can result in serious, even deadly car crashes. Anything that obstructs a driver’s vision, hearing, coordination or attention to the road can result in unsafe driving and dangers to others. Using water in April Fools’ Day pranks and stunts can create slippery surfaces and the potential for serious falls. Someone who accidentally slips and falls on a slippery floor can suffer fractures, broken bones, facial lacerations, neck and back injuries or head trauma. Using dangerous objects in pranks can cause serious injuries. Sharp knives and scissors, electrical devices, tools and machinery and heavy objects all have the potential for causing fatal accidents and injuries. Playing a prank on someone who is on a ladder, staircase, rooftop, or other high surfaces can result in numerous injuries from a fall. Even a short fall from a height of three feet or less can cause sprained or broken ankles, hand and arm fractures, and head trauma. If you are injured, it can be hard to know who to turn to when the pain doesn’t stop. At Bye, Goff & Rohde, we will sit down with you and go over your legal options. We will speak honestly and upfront about your chances of winning a lawsuit. We will help you determine if this is an option you may want to consider. During this difficult time in your life, it’s nice to know that there are people on your side looking out for your best interests and diligently representing you in a court of law. At Bye, Goff & Rohde, this is our commitment and our promise to you. Contact injury attorneys Bye, Goff & Rohde for a free consultation today.